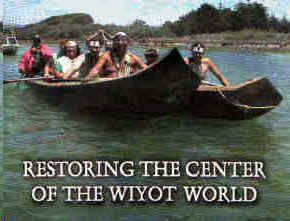 This weekend, the Wiyot tribe of Humboldt Bay, near Eureka, will hold its World Renewal Ceremony. This will be the first time the tribe has performed the ceremony in 154 years. The last time was in 1860, when white settlers ambushed the tribe and massacred more than a hundred people. Both natives and non-natives have struggled to heal that painful past, and the Wiyot say the ceremony is important to the tribe’s future. Halfway across the bridge - as if caught between the past and the present - is Indian Island. This is where, in February 1860, over 100 Wiyot women, children and elders were massacred. The tribe considers this 270-acre island the center of their Universe. If the link isn't clickable please copy and past to the address bar of a new blank tab.